3125 N. Lee Trevino Dr. 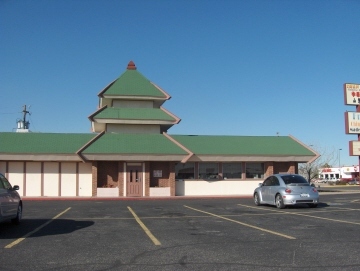 The story of Shan Dong is the same as at several other Chinese restaurants in El Paso. It was started by an experienced Chinese chef who brought some flavorful, innovative recipes to this city that is largely deprived of Asian cuisine. Stories of Shan Dong appeared in the food feature section of the newspaper, and people flocked to the restaurant in a desperate attempt to find an alternative to the many mediocre buffet restaurants in the city. At some point, though, I no longer saw the original owner and found out that the people who had been assisting were now the owners and the assistant cooks were now the head cooks. Unlike other Chinese restaurants that have gone through similar transformations, however, I think the food at Shan Dong continues to be about as good as it was when the founding chef was there. I think some things have disappeared from the menu, but the food now served tastes just about as good as ever. There is no buffet (thankfully), and all food is cooked fresh when ordered. In my opinion Shan Dong has remained the best choice on the east side for food with a real Chinese flavor. The main drawback I can see from Shan Dong losing its original chef is that there are no specials offered, and no items are ever added to the menu. The cooks learned how to replicate the original food, but apparently are not able to be innovative with new dishes. Maybe they know customers expect the food to be the same every time they visit, and this is not necessarily a bad thing. One of the best features about the food here is the presentation; food items have a deep rich color and are served with an orange and garnishes. Lunch includes either hot and sour soup that is deep brown or egg drop that is deep yellow. I am usually given a colorful array of condiments that include plum sauce, hot mustard, and chile oil. 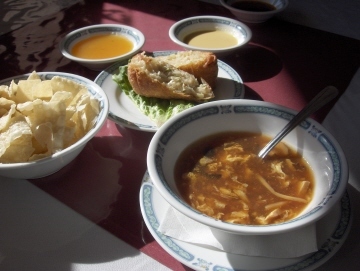 Hot and Sour Soup is very good, and the Egg Roll is even better. The menu at Shan Dong is a little different than most Chinese restaurants. Most items come with full or half orders, and both are available all day . There is no lunch menu, but if you go during lunch hours (11:30 a.m. to 3:30 p.m.) you receive a complimentary soup and egg roll. This alone almost makes it worth going to Shan Dong. The Egg Roll here is the best in El Paso (I do not need to qualify this as being my opinion, since just about everyone who has gone to the restaurant with me agrees). It comes with chicken inside, but even if you pick the chicken out to make a vegetarian roll you are still left with a delicious roll of substantial quantity. The hot mustard served with it is outstanding, and the fact that it varies in thickness indicates that it is made fresh daily. The Hot and Sour Soup has received compliments from just about everyone who has accompanied me to the restaurant, and I like it as well (but I still prefer the versions served at some of the more authentic Hunan and Sichuan style restaurants in other cities). 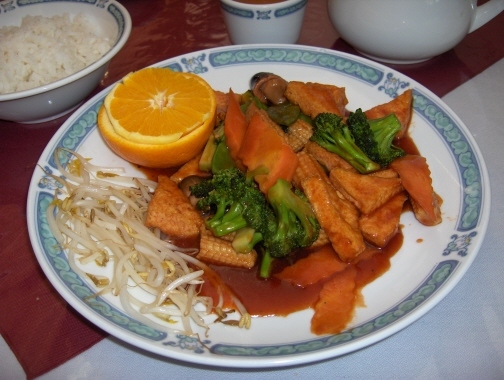 I generally order the Home Style Tofu, and most of the time it is excellent. The sauce is a red color and is thick instead of runny as at most restaurants. Although the quality is variable, it varies between excellent and good. Shan Dong usually makes this dish spicy, but will also serve chile oil on the side. The lunch special comes with shrimp, but it can also be ordered vegetarian if preferred. The general consensus of opinion is that the chicken items are best: General Tsou's Chicken, Double Cooked Chicken, Crispy Chicken, Lemon Chicken, etc. I generally consider most of these to be Americanized gooey and syrupy dishes, but they taste better here than at most restaurants. The spicy ones (such as General Tsou's chicken) are specialties of northern China, the type of food I think Shan Dong does best. Noodle Soup is a dish I consider to be more representative of traditional northern style Chinese food than many of the things on the menu, and it is also one of my favorites at Shan Dong. This soup had a milky colored broth that was different from others I have seen, and was very good. Noodles were the thin type that did not fill me up on starch, so that the meat and vegetables were more predominant than in some other versions. Chinese green vegetables were included, and overall I was very impressed with the soup. 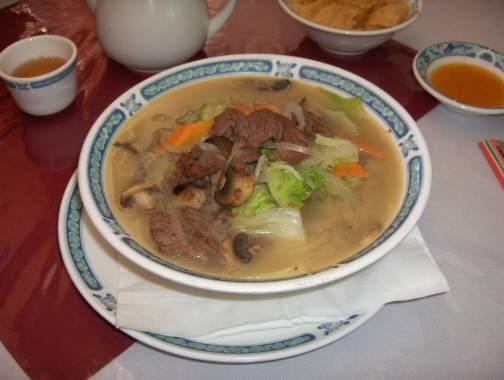 The soup comes with either beef or shrimp, but since each one is individually cooked it can probably be made to order if customers would like something different. The jasmine tea is brewed in the kitchen and is outstanding--it would hold its own with most of the house teas served in Chinese restaurants on the west coast; the only difference is that at Shan Dong it costs extra. Service is slow during the noon rush, so a warning is in order--do not go to Shan Dong if you have to be somewhere at a certain time, even if you think you have plenty of time to spare!! The ladies who wait the tables are very nice, but they never seem to be able to handle the rush of people who come for lunch. I have seen some Korean items served and I think this is the one case in which customers can order items not listed on the menu.